I just found the contents of the Weblin Code Wiki. It has technical documentation of Weblin. 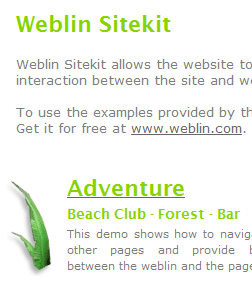 The most important part is probably the Weblin Sitekit framework. Weblin Sitekit lets Web pages communicate with the Weblin client. You can create great applications with this framework. There where examples of an interactive adventure, a dance floor, where avatars would dance automatically. You can create an avatar theater where avatars play a script. And there more features hidden in the Wiki.